Opticians Dorothy Reynolds, left, and Glenn Bemus with the new line of Ronit Furst handpainted eyewear from Israel at their store at Optical Alternatives at 2480 Black Rock Turnpike in Fairfield. For glasses, Fairfield-based Optical Alternatives is offering art you can wear. Although the nearly year-old independent eyeglass store carries frames from 10 countries, the newest line, designed by Israeli artist Ronit Furst, has caught customers' attention. Formerly a ceramic artist creating soup pots and decorative cookware, Furst began using her artistic talents painting eyeglass frames in 2002. 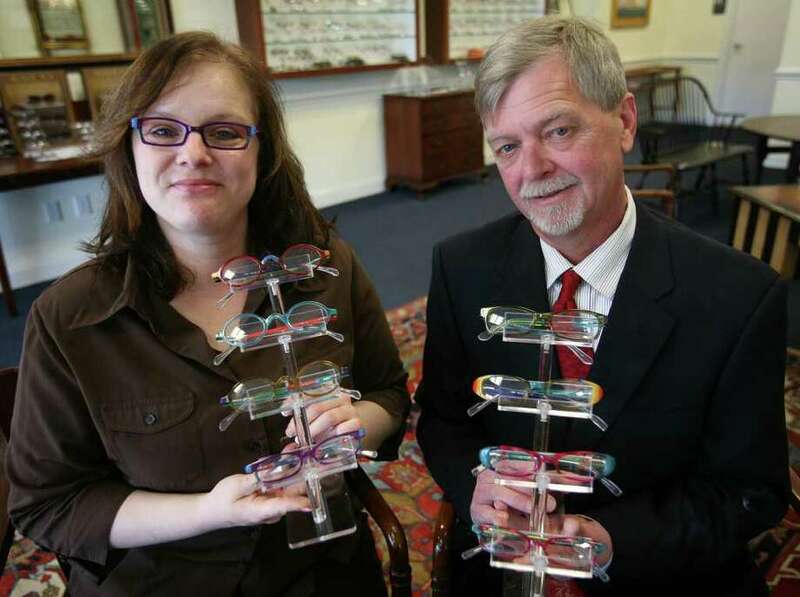 "She found all glasses boring, so she decided to make her own," store manager and licensed optician Glenn Bemus said. The frames, which come in 35 styles and about 35 color combinations, are striped, polka-dotted and layered with vibrant hues. "People stop outside of our store and look through the window," Bemus said. "It's real eye candy for the store." With about 1,200 frames from different parts of the world, he said he looks forward to getting more styles in the future. Bemus, who also carries designers including Gucci, Coach and Serengeti, said his store strives to offer the best value, quality and a selection of frames that may not be found at other stores. Still, the Ronit Furst line allows Optical Alternatives to represent yet another country and to diversify the store's inventory. "We had unique glasses already, but this rounds it all out for us because of the colors, the styles and the boldness of the line," Bemus said. "No two frames will ever be the same, and you can design your own color and style combination." Bemus has 28 years of experience as a licensed optician and his colleague, Dorothy Reynolds, has 23 years in the optical industry. Reynolds, also the president of the Connecticut Opticians Association, said eyewear can be as much an accessory as a pair of shoes or jewelry. "Some people are very concerned that their glasses won't match their outfit," she said. "When you have frames like the Ronit Furst frames, how can they not match something?" She said the line is a bold way for people to break out of their eyewear shells. "How many pairs of shoes do you have?" Reynolds said. "And where do you think people are looking? At your feet or at your face?" Although primarily a women's eyewear line, the Ronit Furst collection offers several pairs of frames for men and children. Optical Alternatives grinds lenses for customers on the premises to ensure precision-accuracy. "We really are frame stylists," Bemus said. "We assess the person when they come in to see what colors and what jewelry they may be wearing in order to find the right frames." He said customizing the size and shape of glasses is the key to a successful eyewear business. "You have to know your customer base and how fashion-forward they are going to be," he said. "Our No. 1 goal is that you get compliments on your glasses."